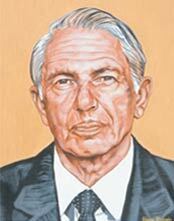 Victor Daitz was a Jewish entrepreneur who spent most of his business life in Durban. He was born on 23 January 1913 in Johannesburg. His parents, Bernard and Annie Daitz, were Jewish immigrants who came to South Africa from Lithuania. They became merchants in the textile industry. Victor was educated at King Edward VII School in Johannesburg. His tertiary education was taken in England, at Leeds University, where he qualified with a Diploma in Textile Industries in the late 1930s. Upon his return to South Africa, he joined the family business which became known as Natal Cotton and Woollen Mills Ltd. After the deaths of his father, mother and older brother, Morris, he became the sole owner of the family business. He was highly respected as an industrialist and entrepreneur. He was also a pioneer in the plastics industry. During the 1950s, Victor sold the business and went into retirement. He was an astute investor and collector of objet d�arts. His pastimes included playing tennis, golf and reading. He travelled widely. He remained throughout his life a quiet and unassuming gentleman of humility who never sought publicity. As a humanitarian and philanthropist, it was always his wish to put back into the community the major portion of the wealth that he had accumulated during his lifetime. This led to the formation of The Victor Daitz Foundation in 1984. In March 2004 he was posthumously awarded the Paul Harris Fellowship by Rotary International. In recognition of the fact that he became the architect of such a magnificent charitable edifice, his epitaph is taken from the Biblical description of the architect of the ancient Jewish temple in Jerusalem � �a man of insight, wisdom and knowledge� � and to this was added �and charity�.